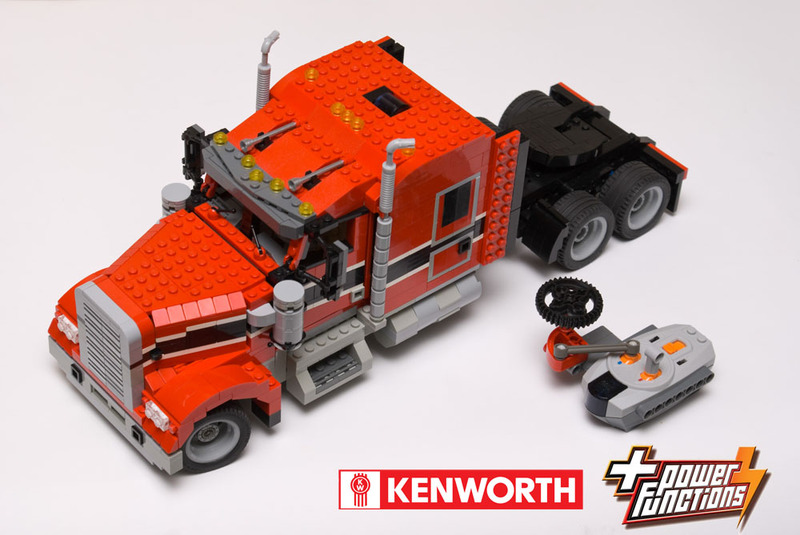 It is a model from a Kenworth W900L truck, controlled by Power Functions. Very compact and large steering reduction (using a worm gear) to make it easily remote controlled when motorized (via Power Functions RC). 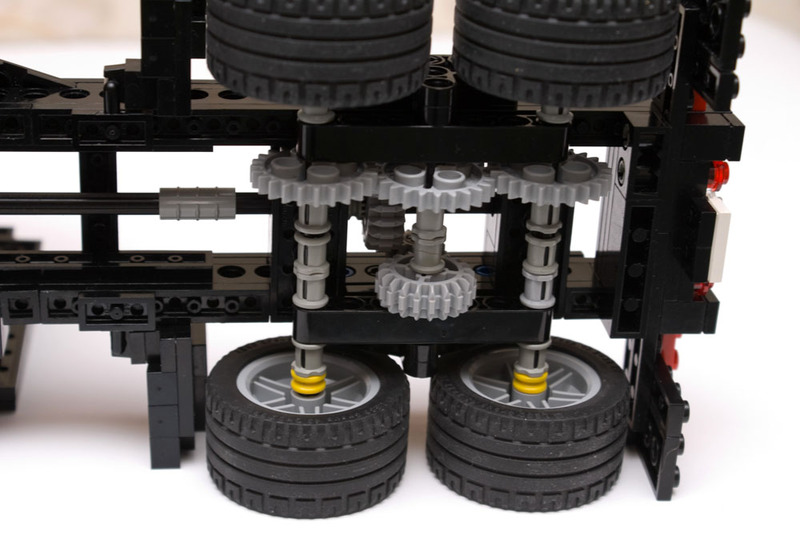 Rear drive train, with 4 driven wheels and unsprung pendular suspension. However this design lacks an independent oscillation solution for each truck side, like we can see from Jennifer Clark's Demag AC50-1 simplified diagram, on the image at right (examples 3 and 4). That's correct that Jennifer illustrated solution doesn't represent an all-wheel drive mechanism (as on figure below left), however it could be achieved by using a differential which separates each side driving mechanism. Then a similar geared construction at each side, could be used to drive all the individual wheels. The RC adaptation is also a very nice construction detail (however this is a subject for a coming post with a lot more and different implementations, for similar concepts). For static observation of these details, take a look at the respective Brickshelf folder. Meanwhile Marek Markiewicz from LUGPol, shown me also his 6-wide PF MiniTruck, which I decided to add here in this post because of subject similarity and time coincidence. This example also got a PF controlled front steering, and all PF elements are hidden inside the trailer. Look into Marek's Brickshelf folder, for further model images. Pretty cool, leaves me wanting to do something like that. I have seen this before, it's really a five star model. I wonder why he didn't use differentials at the back? This is my MOC, I built it two months, using drawings and a photo of real W900L. I didn't use differentials because I haven`t them. I have already reduced turn radius, by using new design of a forward suspension. Work proceeds... Wait the road train! Still today, I plan to edit this post to another PF truck, but a 6-wide one this time. The 6-wide trucks are wonderful. I had a feeling that if Power Functions can make City size vehicles mobile, this will be just awesome, but I didn't think it was possible. So it's great to see that this is possible! I would love to see pictures of the steering mechanism! 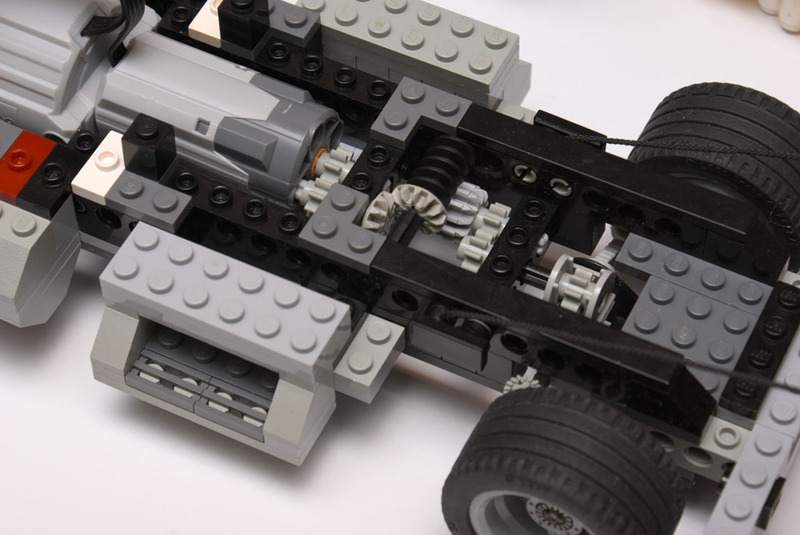 you could see the steering mechanism photos and CAD images, from the Marek Brickshelf's folder indicated in the post. ok, zed, this is awesome!I can just drool at imagining this truck in front of me, if only you had a differential... and you can make it independent at the back. there are tons of improvements you can make to the whole drivetrain, on the other hand, i cant picture a cooler exterior! keep up the great work!